I feel blessed that I have this gift to bring beauty, harmony and function to the interiors of your home that can transform how you live and entertain there. Are you needing a refresh on your furnishings? Here’s a video to get you inspired. The weather is changing, is your home ready? Read helpful hints below on how to be ahead of what ever the weather may throw at you for your home and your car. Everyone has someone that is hard to buy for. There’s an item below if your person is a wine lover. Check your difficult person off, one person done! I bet he doesn’t have one of these! Sometimes a kitchen remodel starts when an appliance breaks down and then blossoms from there. Other times, clients want to change their counter tops without realizing there are things to think about before doing so. See the chart below on how long most appliances last. Also, here’s an idea to put on your Santa list this year. How about a gift certificate to Cara’s interiors? Are there projects you have been meaning to get done, but just don’t know where to start? Do you need a fresh look? It can be as simple as just new paint colors or maybe it’s different art to put up on the walls. Whatever your home interior needs are, Cara’s Interiors can help you find just the right item for you! Are things looking a little tired and worn around your home? Ready for something new? Watch this video on fabrics and how to mix colors and patterns. If this is not your thing and outside your comfort zone, give me a call and we can work on this together until it’s just perfect for your home and how you live. 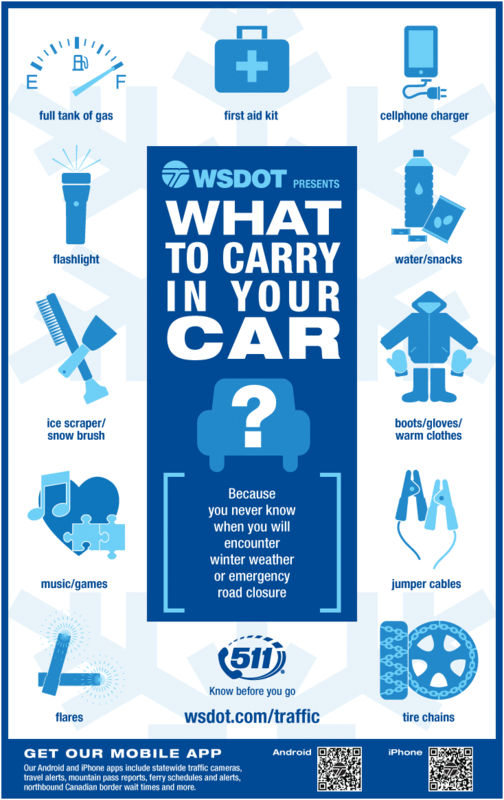 Oh, the weather outside is frightful…….but you can be prepared inside your home and in your car by making sure to have these items around! Look around outside your home. Are there trees that need to be pruned or taken down because they are dead or diseased? Now is the time to do this before those winter winds blow! Clean out your gutters and downspouts. If these are clogged, water could back up and cause roof or siding damage. Seal gaps around the house where critters can make their way in to stay warm. Make sure your steps are not loose and railing are well anchored. Stock up on winter supplies such as batteries and flash lights, candles and wood logs if you have a fireplace. But please, make sure you have had your fireplace and chimney checked by a professional. Make sure to shut off exterior faucets and cover them to keep the pipes from freezing. I know we don’t live in rough winter weather country, but I hear from at least one client a year that their pipes froze! Also, make sure to disconnect your hoses, drain them and put them away for the season. Check your weatherstripping. A lot of heat can escape even with the best window coverings if your weather stripping is lacking. This is a good time to check your smoke alarms and fire extinguishers for expiration dates. With all the baking going on for the holidays, having one of your appliances failing is NOT what you need right now. 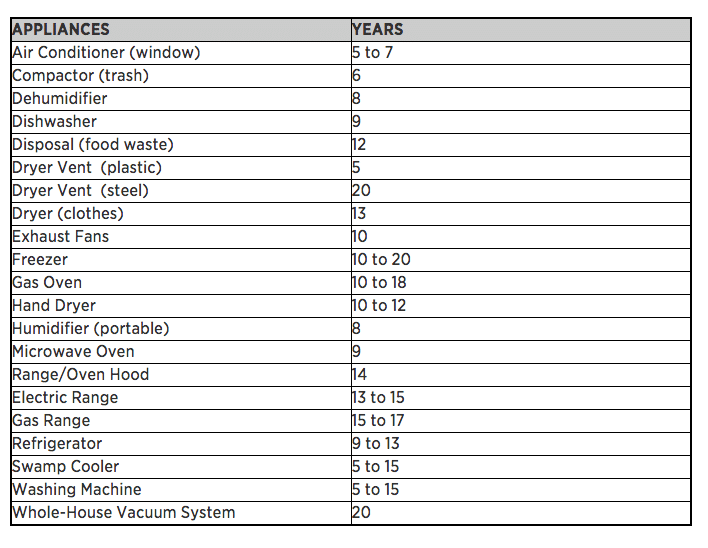 So just how long can you expect your appliances to last, check the chart below for some averages. Did you know that having one of your major kitchen appliances break is one of the big reasons someone decided to tackle that kitchen remodel sooner than later? If that’s the case for you, give me a call and we can start a conversation to see if a kitchen remodel is right for you now. Would you be so kind as to take a minute to review me on Houzz.com? As a home remodeling professional and interior designer, my business relies on recommendations from my clients. I would appreciate it if you would write a brief review for me on Houzz.com. Feel free to upload a photo of your finished space with comments on how working with me made your project special. Thanks in advance and let me know if you have any questions. When you post your review, let me know and I will mail you something to show my appreciation of the time and care you spent doing this.